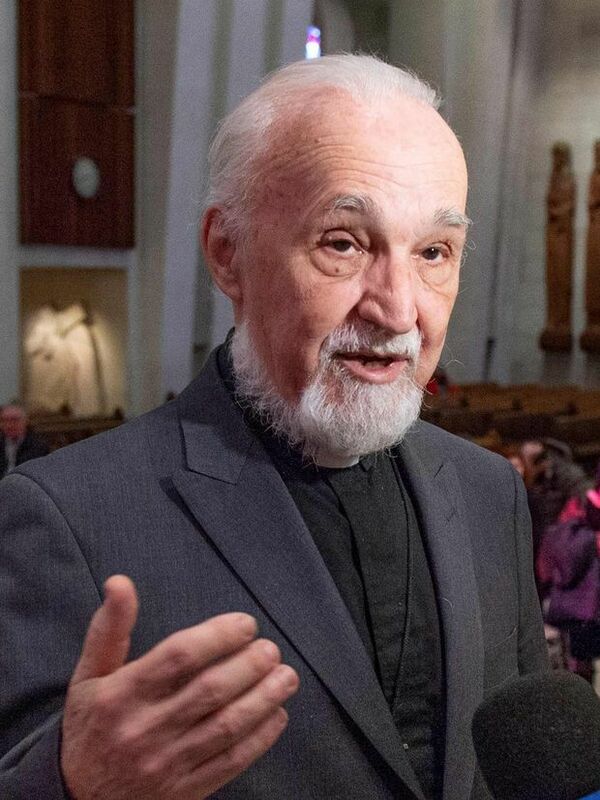 Catholic Priest Claude Grou speaks at a press conference on March 1, 2019, about the work to be done at Saint Joseph's Oratory in Montreal, Que. Father Grou was stabbed during a livestreamed morning mass on March 22, 2019, at the church. Just one week ago, Rev. Claude Grou of Montreal’s Saint Joseph Oratory voiced sorrow on Twitter over the attack that left 50 people dead inside a mosque in New Zealand. On Friday, Father Grou himself became the target of a violent assault inside his own religious sanctuary. The Montreal attack was on a very different scale than the deadly toll in New Zealand. The Roman Catholic priest was stabbed during morning mass and only slightly injured, and the motives of the assailant are unknown. But the two events both occurred inside places of worship and were captured in real time before being shared on social media. Father Grou was celebrating morning mass at Saint Joseph Oratory, a renowned landmark that towers over Montreal. In a video capturing the assault, a tall man in a dark coat and white baseball cap is seen walking calmly past dozens of worshippers, eight minutes into the mass. The man steps toward the altar and charges at Father Grou, who recoils and takes several steps back before falling to the ground on his back. Father Grou was transported to a Montreal hospital and is reported in stable condition. A 26-year-old man was taken into custody by Montreal police and will be arraigned on Saturday. A police spokeswoman described the incident as an isolated act and said the suspect has a criminal record. Worshippers in their pews are heard shouting. Then, some surge toward the sanctuary to block the assailant while others go to comfort Father Grou. “He had only one idea in his head – to attack Father Grou,” said Adèle Plamondon, a witness. She described the assailant as a clean-shaven white man, standing about six feet tall. She said he lifted his jacket and took out a knife. “He was very determined,” she said. The attack was televised live on the Salt and Light station and streamed on its YouTube channel. As it was unfolding, Mr. Vu was answering queries online in real time about what viewers had witnessed. Father Grou of the Congregation of Holy Cross is rector of the oratory, making him the most visible figure at what is one of Canada’s most high-profile churches. The 77-year-old priest normally says mass on Friday mornings, but it isn’t known whether he was personally targeted by the assailant. One witness told a Montreal television station that the weapon used in the attack was a kitchen knife. The violence reached into a storied institution in Montreal. St. Joseph’s Oratory has been greeting the faithful for over a century, drawing two million pilgrims and tourists each year from around the world. Montreal Mayor Valérie Plante called the incident “horrible and inexcusable” and had no place in Montreal. “I’m relieved to learn that the life of Rev. Claude Grou, rector of the [oratory] is out of danger and that his condition is stable,” she tweeted.